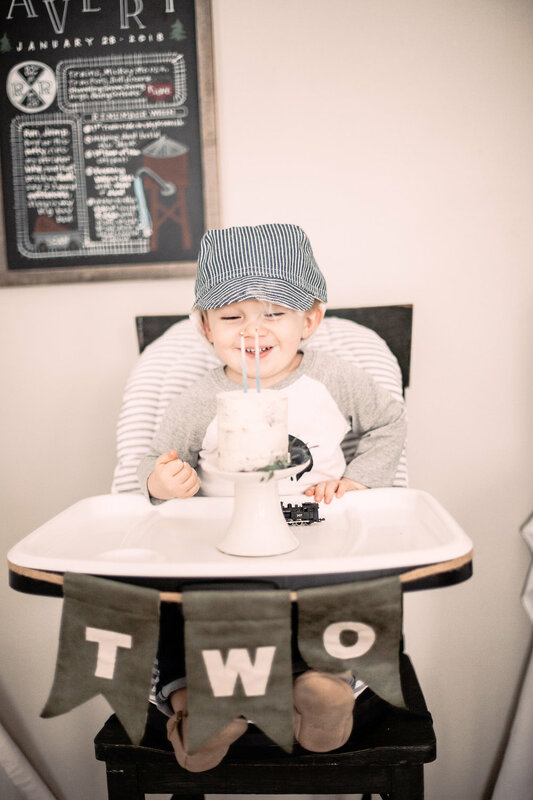 Our darling son Avery turned TWO this month and to celebrate, we had our friends and family over to our house in Leavenworth, WA where I designed a vintage train theme party for him! 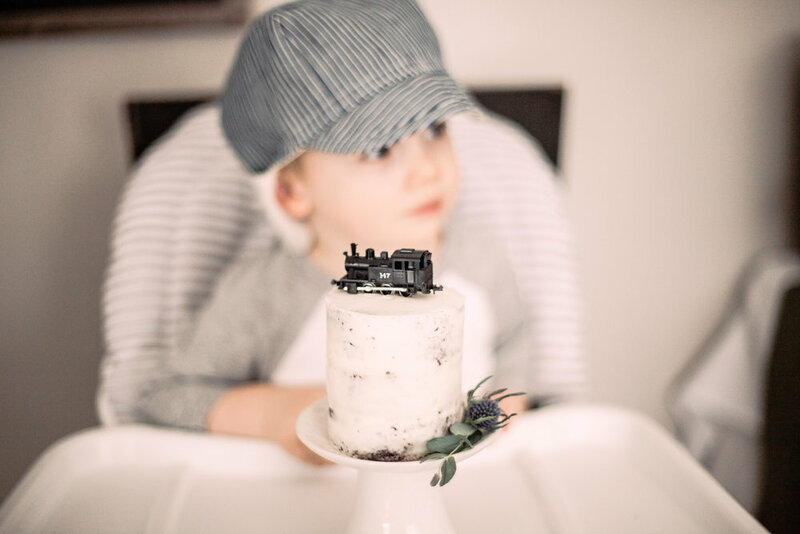 He is at such a fun age right now - his personality shines bright, he has accomplished all sorts of fun little milestones, and he definitely has a love for certain things - one of them being trains. I think it helps that we live near the railroad tracks, and he gets to watch them go by every single day. 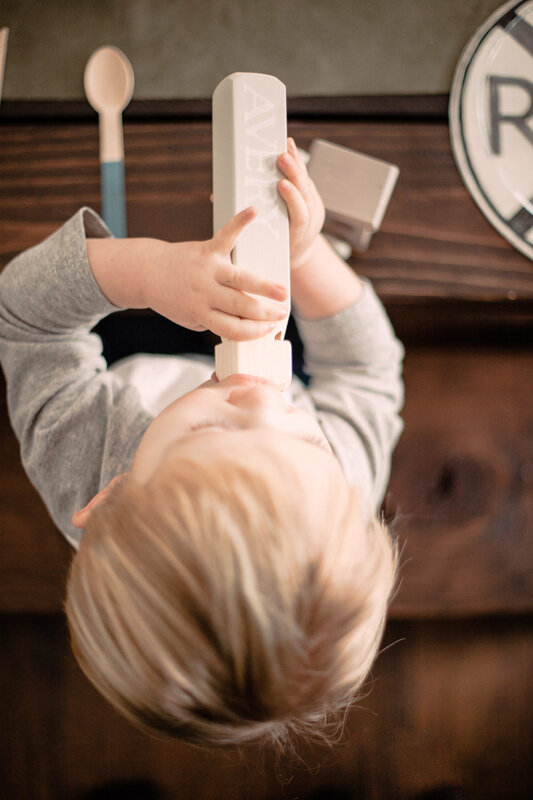 It also helps that my father-in-law David, or "Papa" as Avery lovingly refers to him, is a railroad enthusiast and has collected railroad artifacts for the past 47 years. 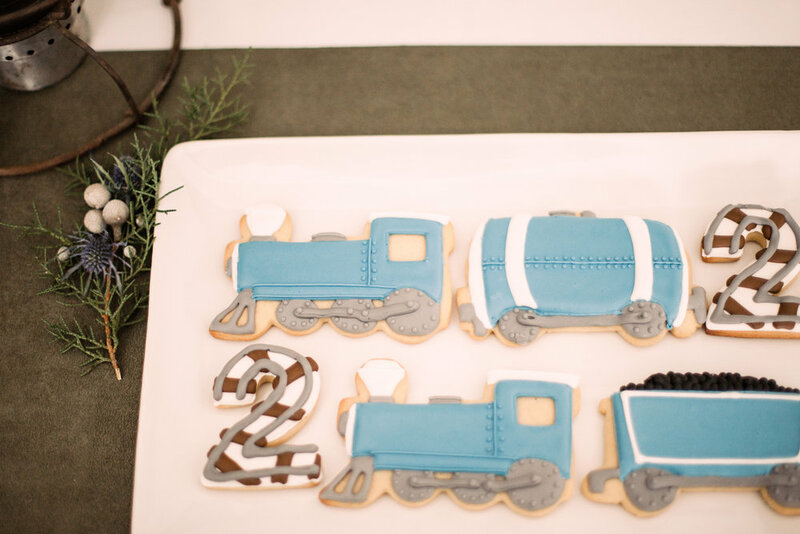 Combining Avery's love for trains plus David's unique Railroad items created such a fun and unique party for our sweet boy! With the theme set, I needed to find the perfect invitations, so I went to Minted and found just that! I fell in love with the darling train design and because we live in the great PNW, the trees were very fitting. 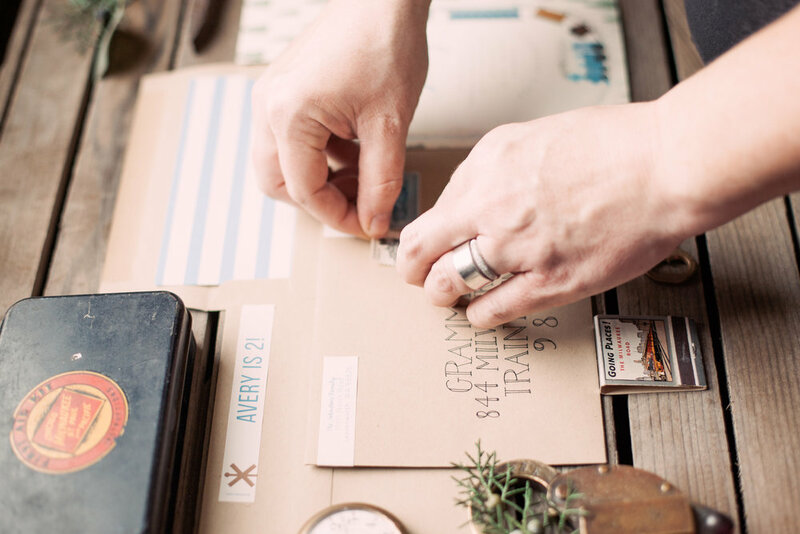 I just love when there are designs on the front and backside of invitations! I like to put the invitations in the envelope with the back side up facing up, so when guests receive their invitation, they get a little sneak peek of what's to come! Based on the invitations, I decided on a color pallet of creams, grays, blues, and greens, and I'm always a sucker for bringing in wood elements to any party. 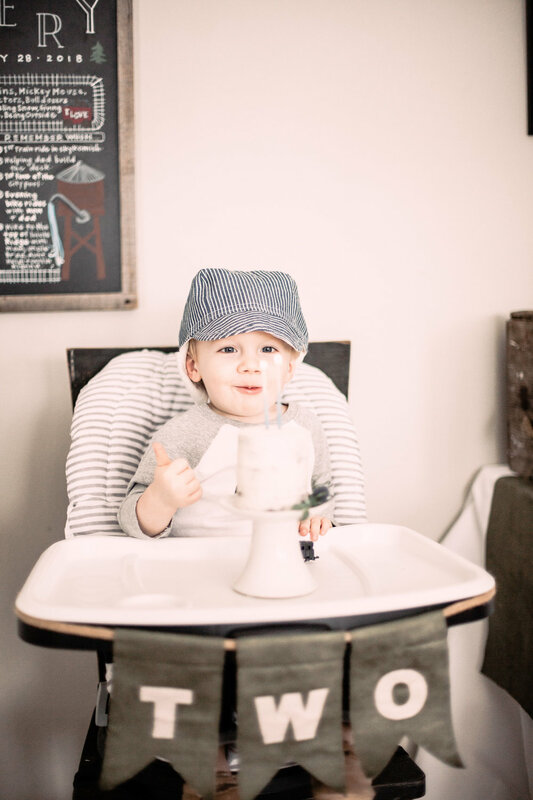 I had a lot of fun going through Avery's Papa's vintage train artifacts, as I am a lover of vintage items myself! I just loved the old locks and keys, pocket watches, matchbooks & safety kits - all items once used on an actual railroad. 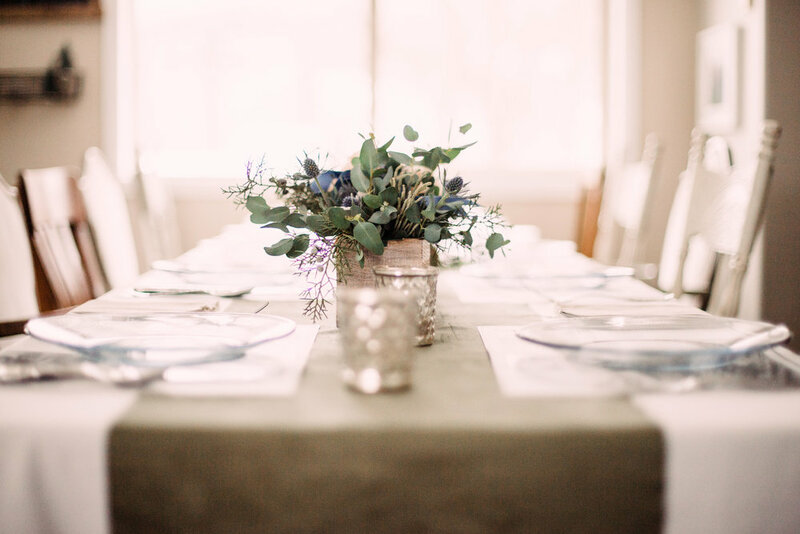 They were the perfect accompaniment to Avery's invitation flat lay. Part of my love and excitement when planning any event, is the thrill & search for the perfect embellishments. Along with the fun vintage train artifacts, I found these sweet vintage train postage stamps on Etsy, that tied in perfectly with the color and theme. 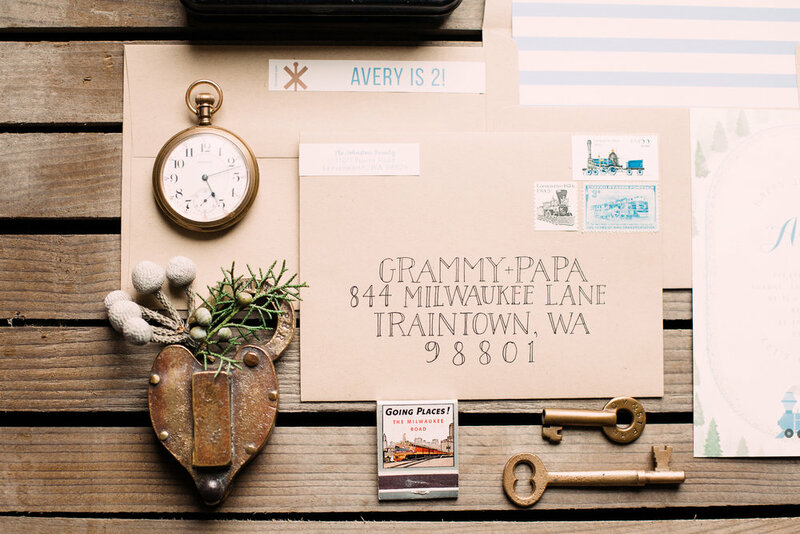 Also tying in perfectly with the font from the invitations, was Chalk Chic Mama's beautifully addressed envelopes. Avery's outfit for the day came together rather quickly. We used our favorite Railroad cap from Little Sun Hat that we got last year, grabbed our favorite neutral moccasins from Freshly Picked, and my husband Aaron made Avery a Birthday T-Shirt from a Great Northern Goat Railroad stencil - which he had made a few years ago for Avery's Baby Shower - that you can see here. We were all set, and our big TWO year old was ready for the day! Guests were greeted with a fun teepee that was set up for gifts. 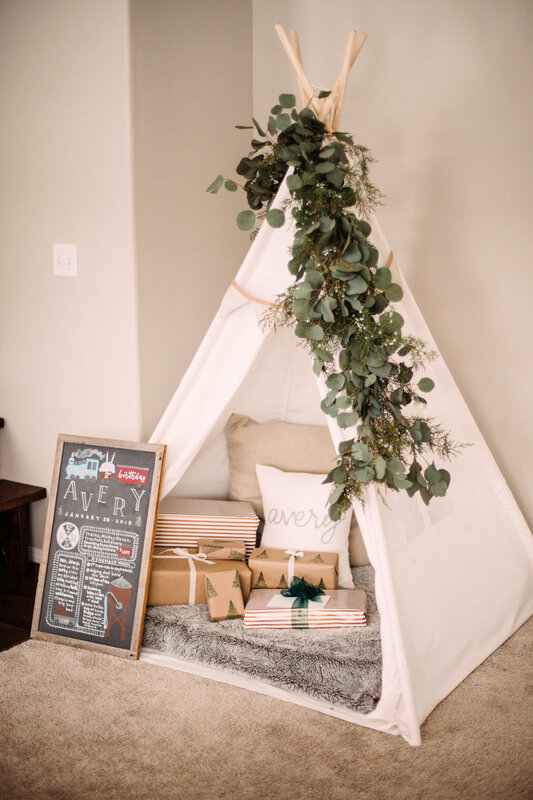 Adorning the teepee was a neutral colored triangle pennant bunting I made, along with a lovely garland of juniper, eucalyptus, and cedar bundles made by my dear friend Tennille of Modern Pod Floristry. The garland was so captivating - I wish we could leave it on the teepee indefinitely! Adjacent to the teepee was the most incredible chalkboard designed by Chalk Chic Mama! Every time we work together I am just blown away! Her talent is impeccable, and her designs are so unique and fresh - she truly has a gift! 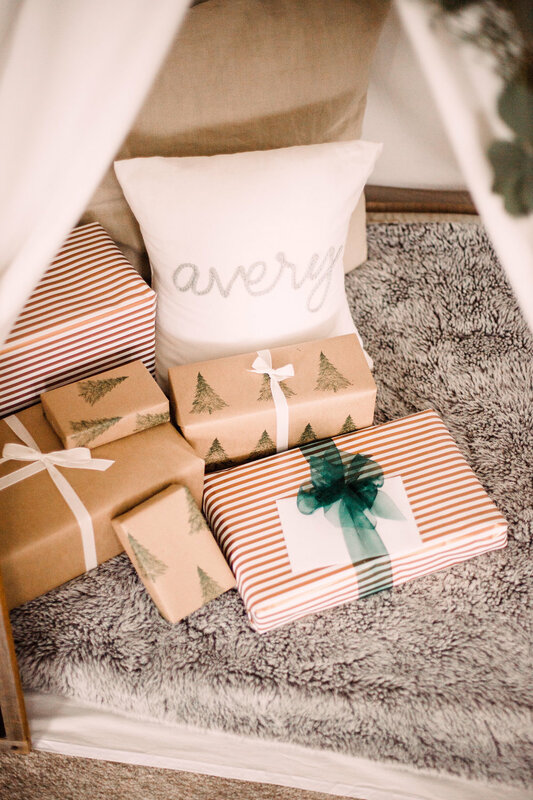 Inside the teepee I wrapped Avery's presents in simple brown kraft paper, but enhanced a few packages with a sweet rubber stamp I found - a simple pine tree - that tied in perfectly with the invitations. The adult table was so fun to design! Tying in with the colors from the invitations, I used soft tan linen napkins, and I found the perfect green suede fabric that I turned into table runners. While searching through David's railroad artifacts I came across old train magazines that I thought would be fun to make copies of and turn into placemats. 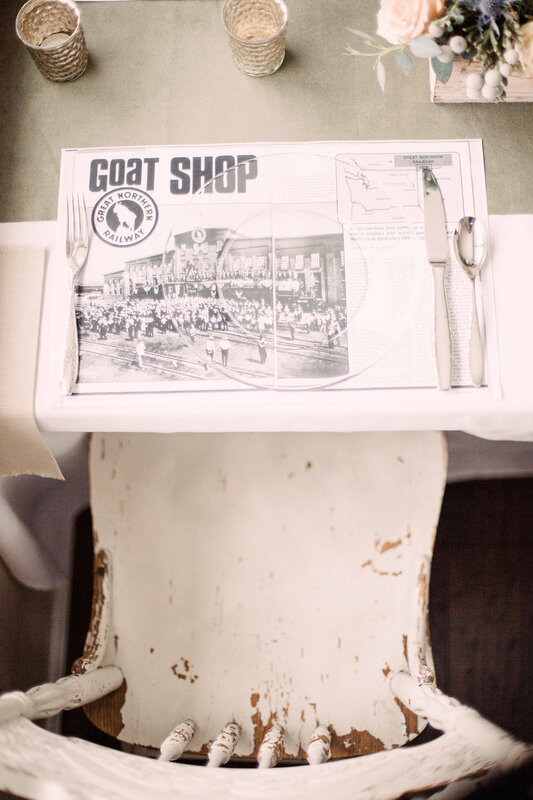 I used clear glass plates so when guests were seated, they could read the articles while they waited for food. 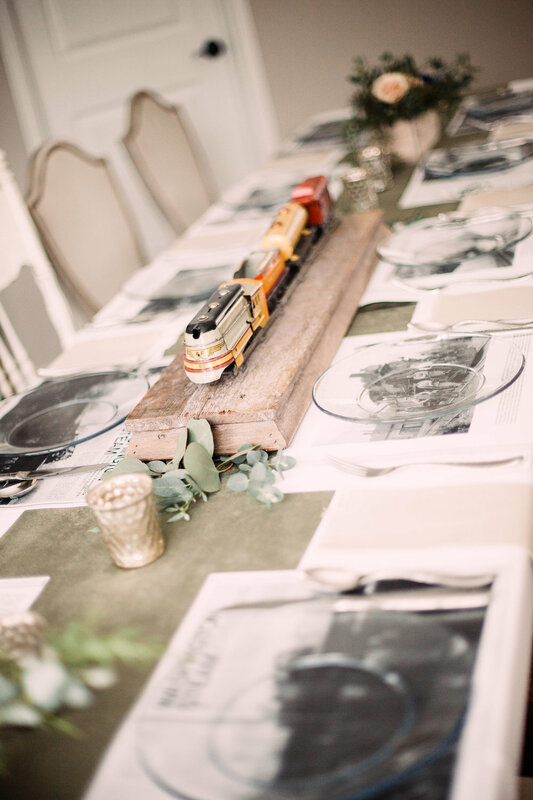 At the center of the table was and old American Flyer Wind Up Toy Train that was patterned after the Milwaukee Road Hiawatha Train Engine - one of David's favorites! On either side of the wind up toy train were the most beautiful floral arrangements - designed by Modern Pod Floristry. 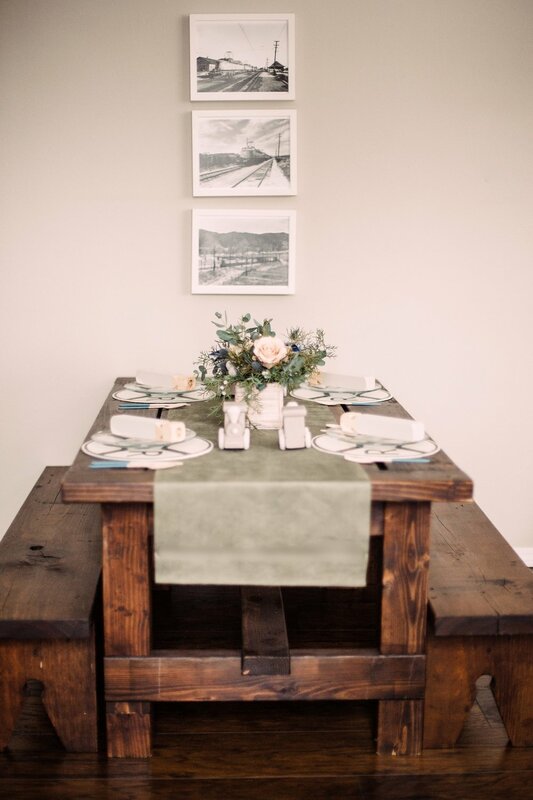 Tennille used soft hues of greens, grays, and blues that matched our color pallet perfectly, and the gorgeous color of the quicksand roses she chose, tied in nicely with the vintage feel. children seated and playing here! Above the table I placed old black and white train photos that my father-in-law David had taken over the years. I found a great tutorial on Pinterest on how to paint your own vintage railroad crossing sign, and thought it would be perfect to make some cute chargers for the place settings. I think they turned out pretty darling! For the favors - you may have guessed it - Train Whistles! I painted them in a soft neutral color, and then had Chalk Chic Mama personalize each one with each child's name for a more special touch! I loved how they turned out! 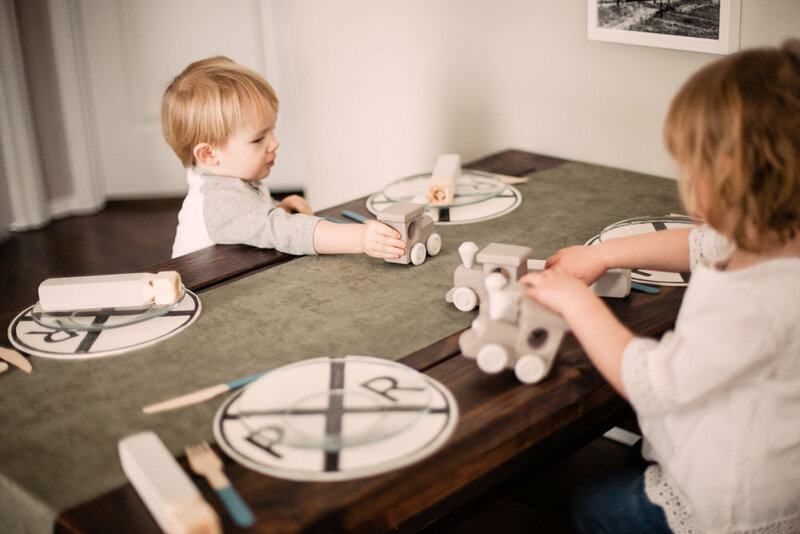 Each child also received a wooden toy train engine, that I also painted in soft neutral hues. 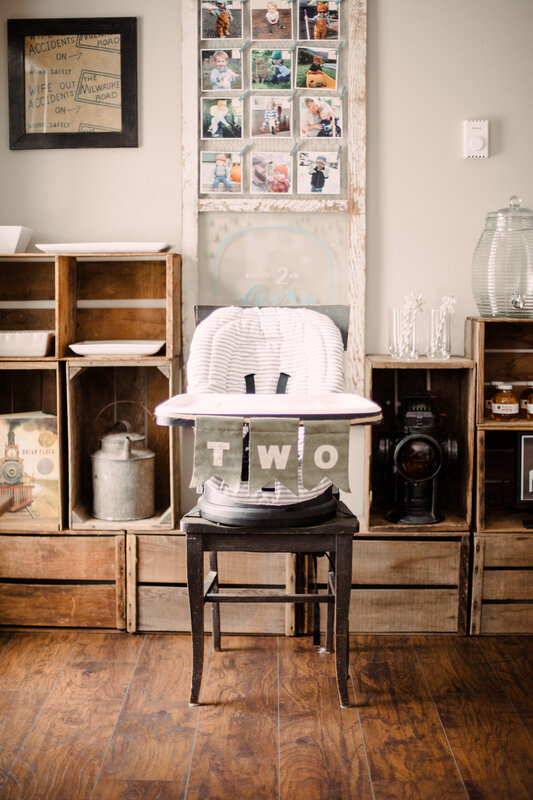 I just adore these sweet images below that were captured perfectly by Kara Meloy! 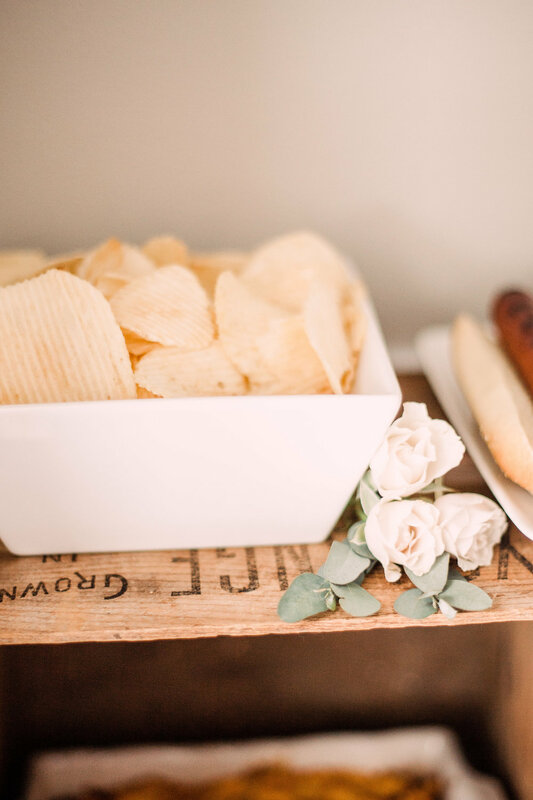 The food station was filled with lots of rustic charm. At the center, I placed an old window/chicken wire frame my husband had built and added photos of Avery for guests to see how he has grown over the last year! Adding a sweet touch to the window portion, Chalk Chic Mama delightfully mimicked the train illustration from the invitation. 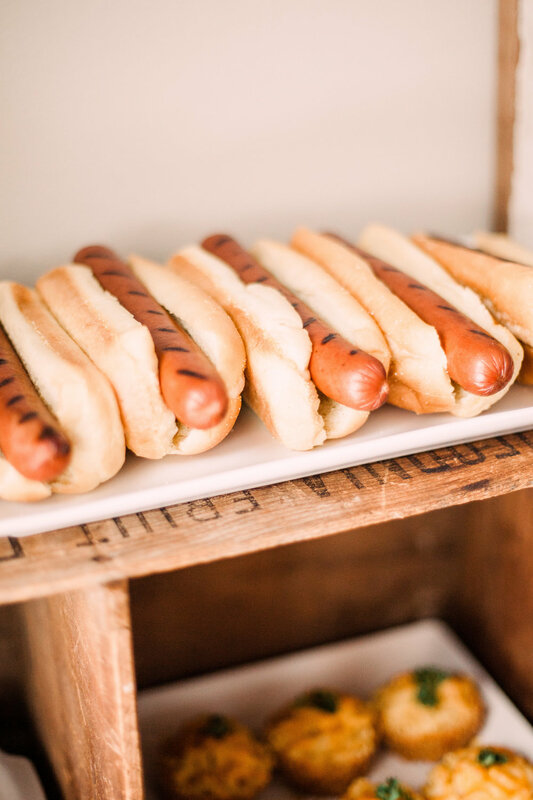 For the food I decided to keep it simple, and use some of Avery's favorites - macaroni and cheese & hot dogs! I found darling apple juice bottles for the kids, and made some cute railroad crossing drink flags for the adults. Avery's birthday wouldn't have been complete without a number TWO banner, so I sewed and hand stitched one using some leftover green suede fabric from the table runners. The cake table I also tried to keep simple, and tie in with the rustic charm. Cupcake Blues made the delicious chocolate semi-naked two-tier cake, as well as the mini cake just for Avery. 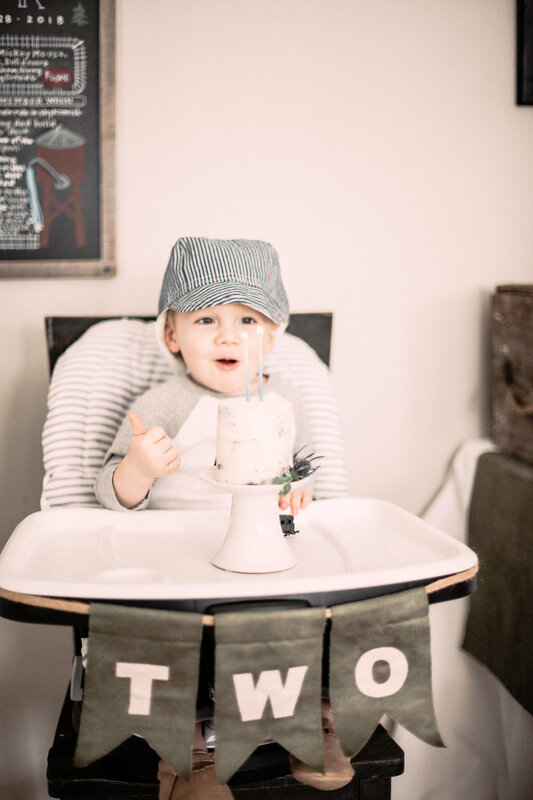 He had a mini cake similar to this on his first birthday, and I decided that they are just too cute and that he needed another one this year! We used our "go to" cookie gal Stefanie, from Prep and Bake for the adorable sugar cookies! Her talent is out of this world and she never disappoints! 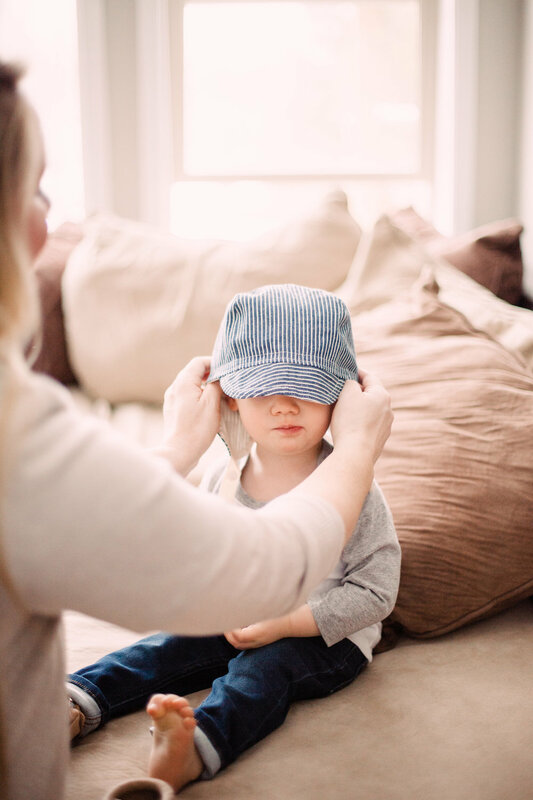 My heart just melts over these last few images of our happy guy taken by Kara Meloy. 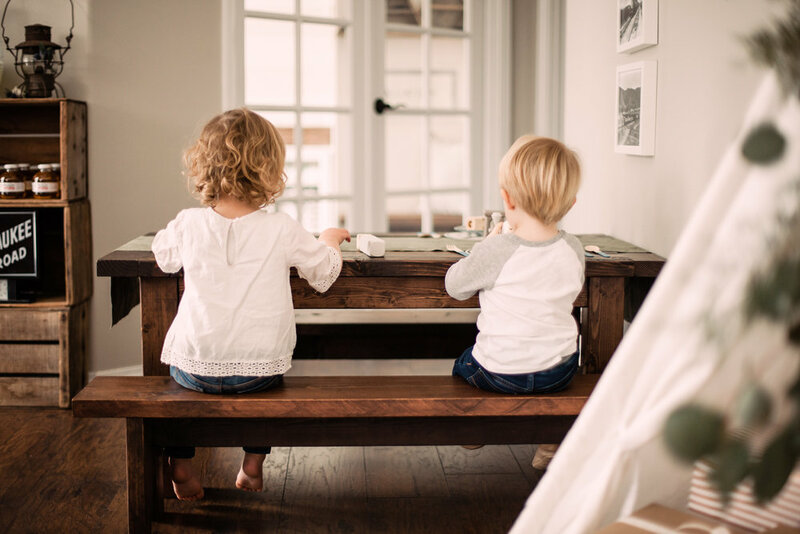 She captured his excitement impeccably - such sweet images that we will cherish forever! It was such a special day filled with lots of love, excitement, and sweet memories of our birthday boy!